Best Chinese Knives: Ganzo Firebird G756 F7562 Review: Good EDC Knife! Ganzo Firebird G756 F7562 Review: Good EDC Knife! So this will be a short review of the Ganzo F7562. The knife came in the (now) standard Ganzo Firebird branded box. The fit and the finish were good, so was the action (surprisingly smooth), the centering and sharpness. The only issue it had was a slight flex in the vertical lockup, no horizontal play at all. - The looks. The knife is really stunning and well executed. - The ergos. Sits well in my medium sized hand (probably will fit most hand sizes). - The finish. That relates to the machining of the famous Ganzo CF laminate and the stonewashed finish on the blade. - Symmetrical grind and sharpening. - The details. Skeletonized liners (for weight reduce), good gimping and blued hardware. The action is also very good out of the box. - The steel. Good old 440C from Ganzo (that they have learned how to heat treat properly). There are advantages to sticking to one kind of steel on most of your models. - The pocket clip. From one side it functions well, one the other - I'd love to see a black deep carry one on this knife. - That vertical flex (can't even say it's a blade play). It doesn't interfere with the action and the lock still functions well as can be seen from the spine whack test below, but it's always a bit unpleasant when it's there. I know I probably got a lemon, but I have heard from others that they don't have that problem. If not the flex, it would be one of the better knives I ever got from Ganzo (on par with the F753M1) and one of my favorite knives overall. 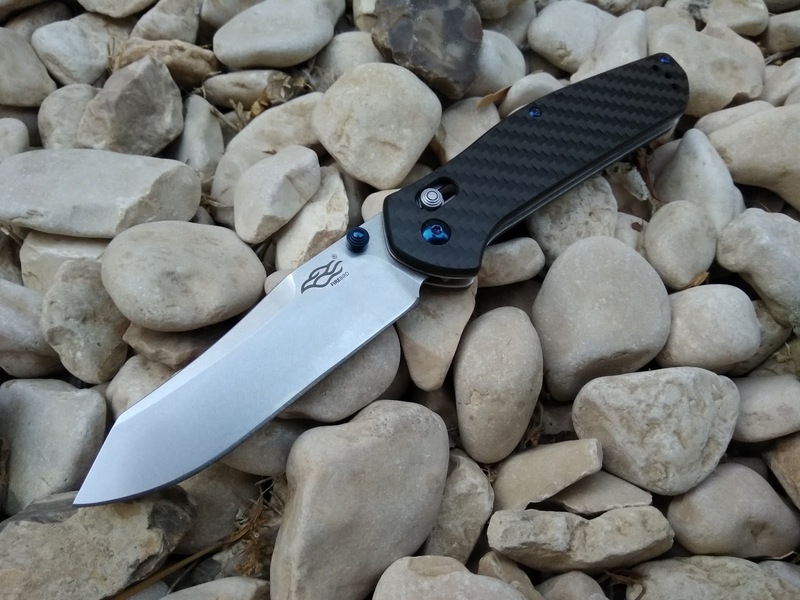 With that being said I still like it very much for the other positive features and the spine whack test convinced me it is a solid blade, so I will use and carry it in my rotation. Nice review...I have one on its way from China as we speak. I didn't really mean to buy it when I bid on it on Ebay. The more I check out reviews the more I am happy to have it coming. Mine is the regular G10, though, so it has those garish green stripes. The CF is definitely the way to go! Ganzo Firebird G756 F7562 Review: Good EDC Knife, is getting very positive reviews all over the internet. I will buy one now. Thanks for posting.